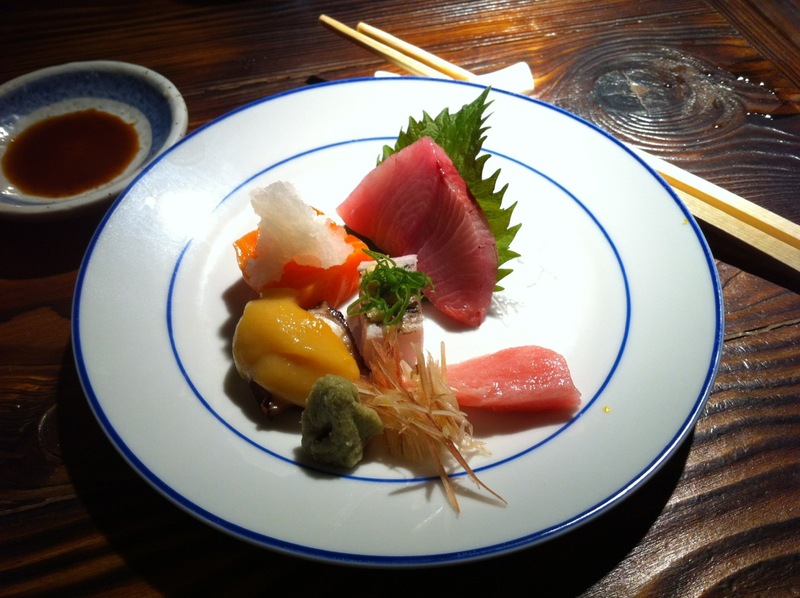 Every season, Hachi changes its menu. This is the highlight of Spring 2012. 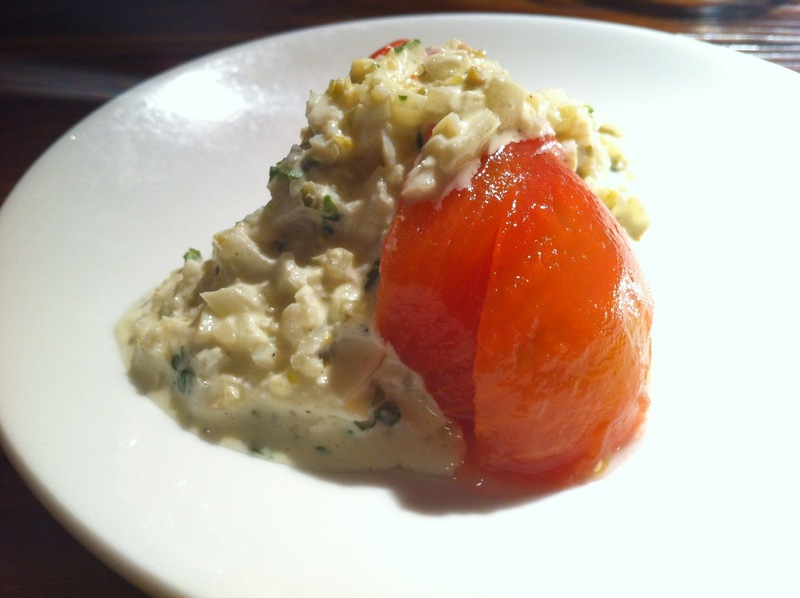 Japanese tomato is sweet and was pre-soaked in Kombu stock to give it a savoury taste. Topped with tartar sauce that is mixed with chopped onions and italian parsley. 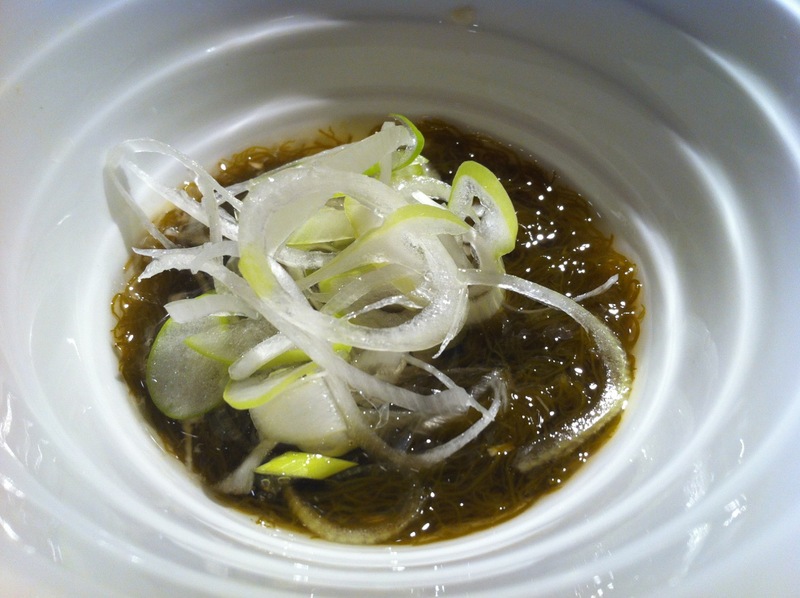 This is not the dried variety, but live seaweed in ponzu sauce. Very refreshing and whet your appetite for more. When this came up, we went “huh?”. So good, that my daughter asked for a full plate of this. 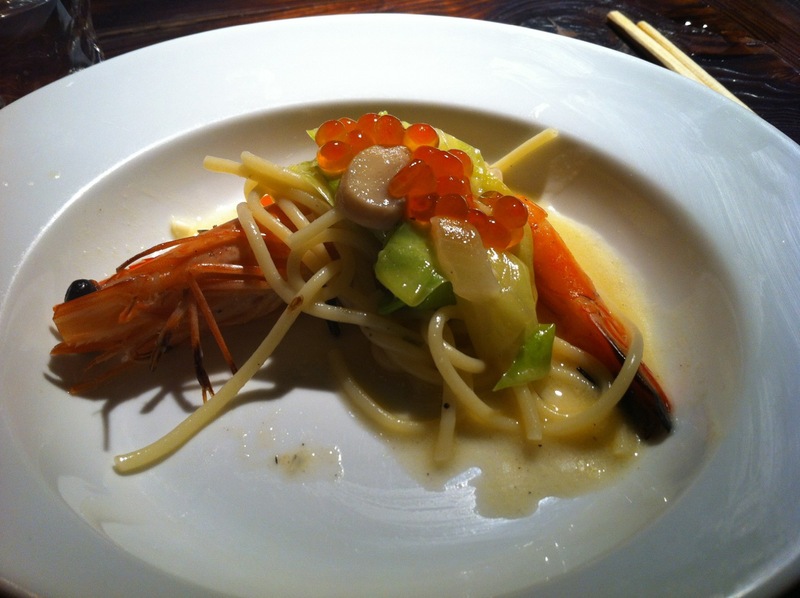 Japanese cabbage with a cream sauce slightly spiced with tabasco, paired with the grilled prawn. Perfect balance. Tako with a sweet miso paste, otoro (a very small specimen was offered), sake, kajiki. 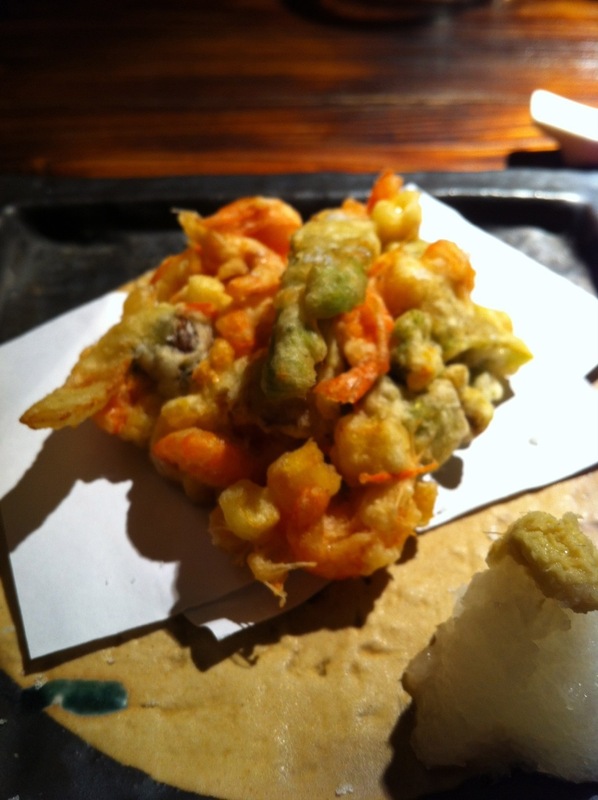 Sakura shrimps mixed in tempura batter with an assortment of vegetable (carrot, okra, etc) and an unknown flower, and deep-friend. The taste is delicate and well-balanced. Enjoyed this one – esp. Sakura shrimp is in season. 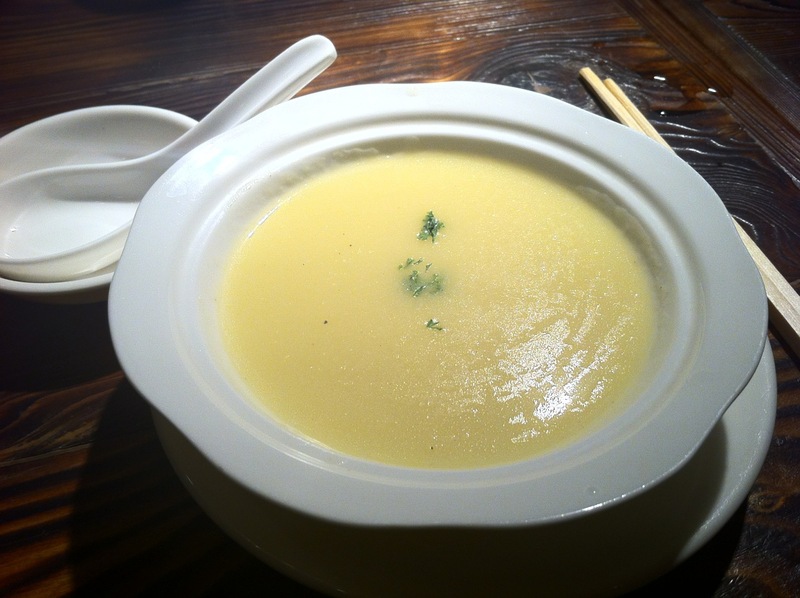 This dish is a bit of disappointment, because there is not structure or layer of tastes. 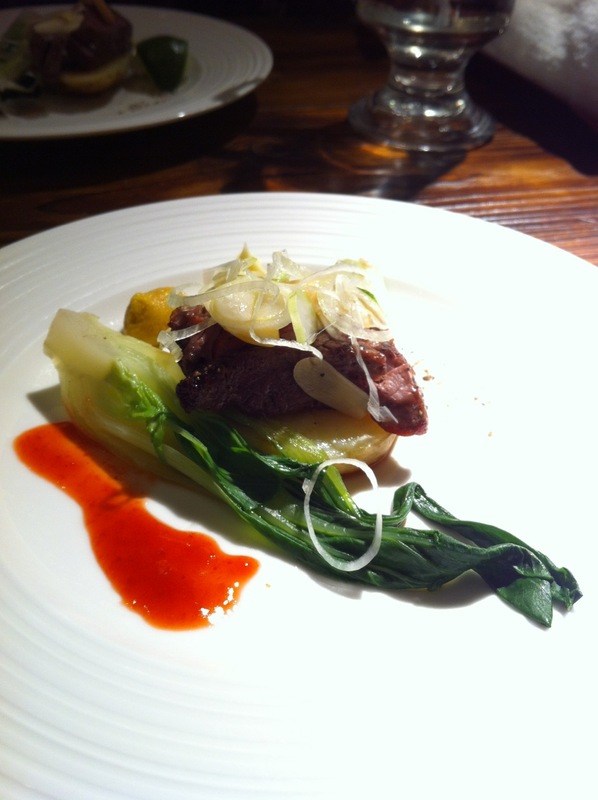 The waygu beef was grilled to perfection, but the leek and garlic with the unsavoury red sauce totally destroyed it. 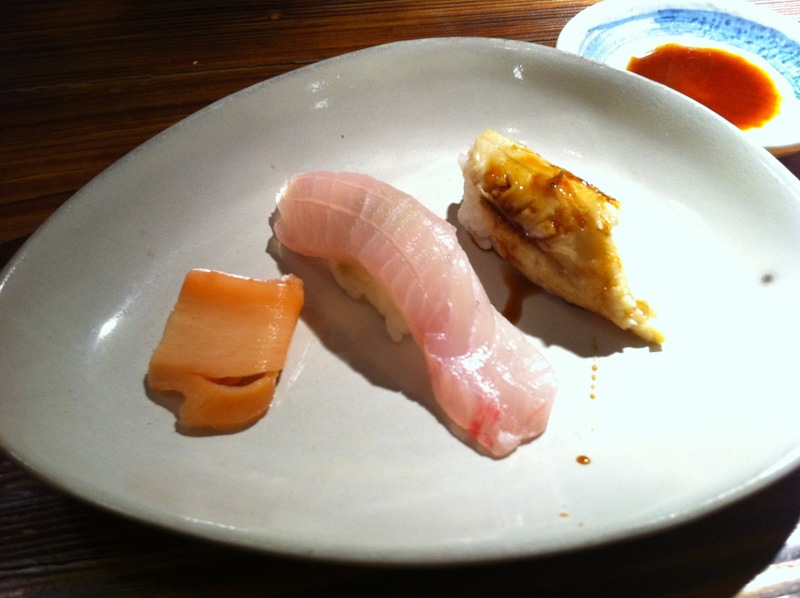 2 pieces of sushi – a Shima-achi and an anago (sea-eel 星鰻) sushi. 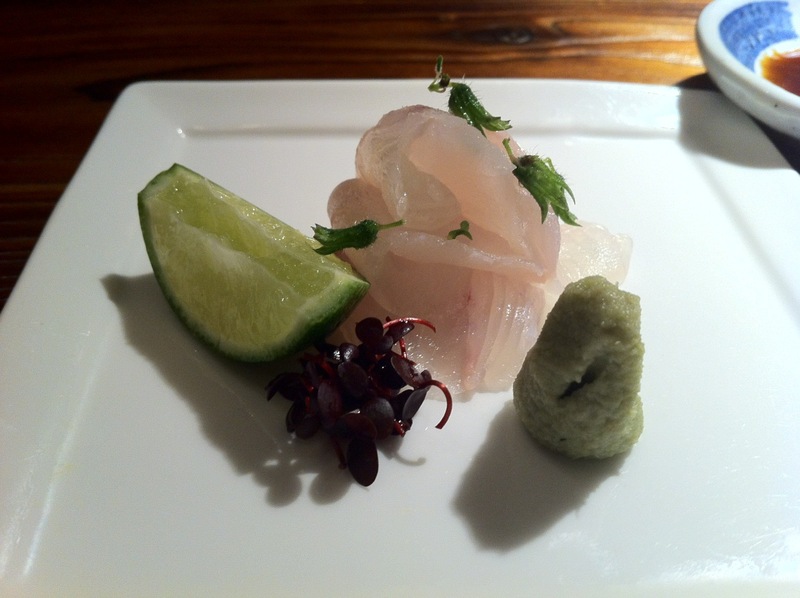 OK, hamachi was featured in the sashimi, but the anago was a surprise tonight. The texture of anago is more tender and the bones finer than unagi (river eel), and you do not have the mud-taste of unagi. Therefore it just needs to be lightly grilled with the sweet sauce. The piece of anago on the sushi was too small 😉 Watanabe-san. 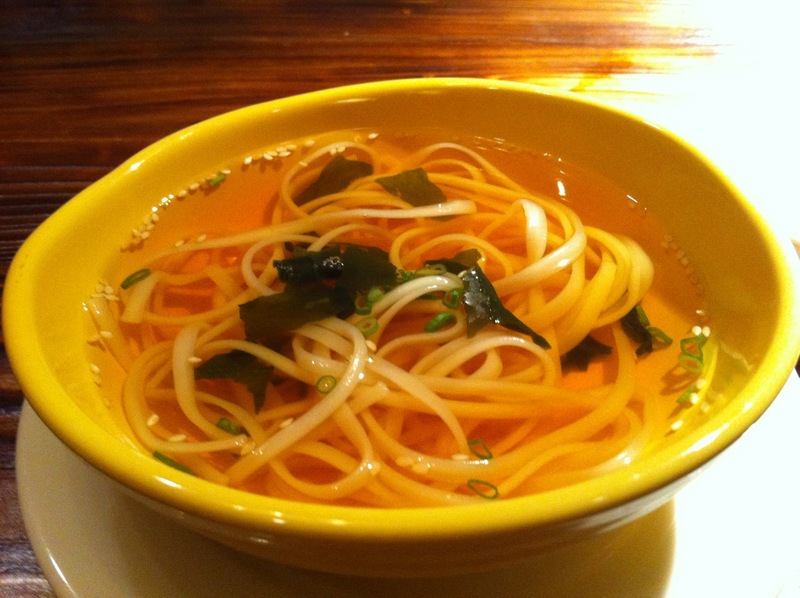 The filler of the dinner, a clear soup noodle, nothing to shout about. Watanabe-sam makes his own ice-cream most of the time, and he would experiment with weird flavours like black sesame, wasabi, and tonight’s macha. 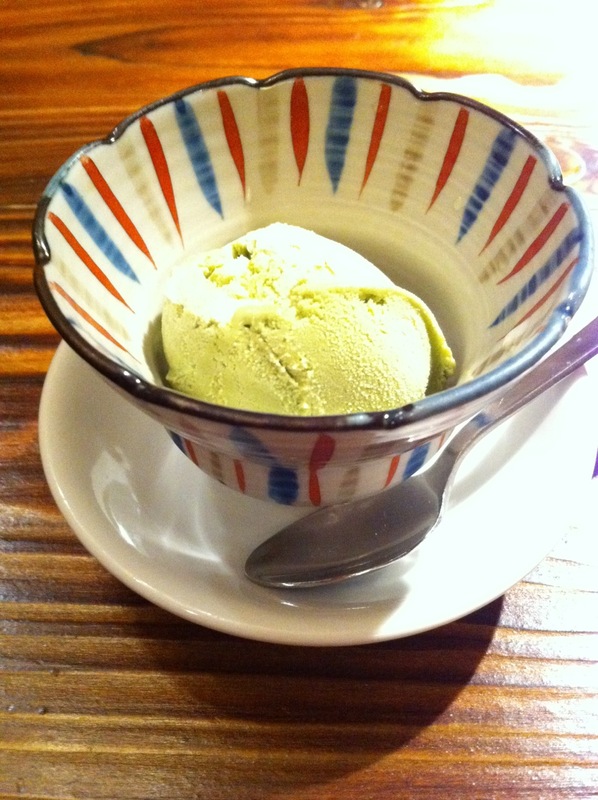 It has a balance flavour of macha and milk, almost like Pocka’s Milk Coffee but in Macha flavour. This is an extra dish on the house. Just to add, the omakase is enough even for a big eater like myself. 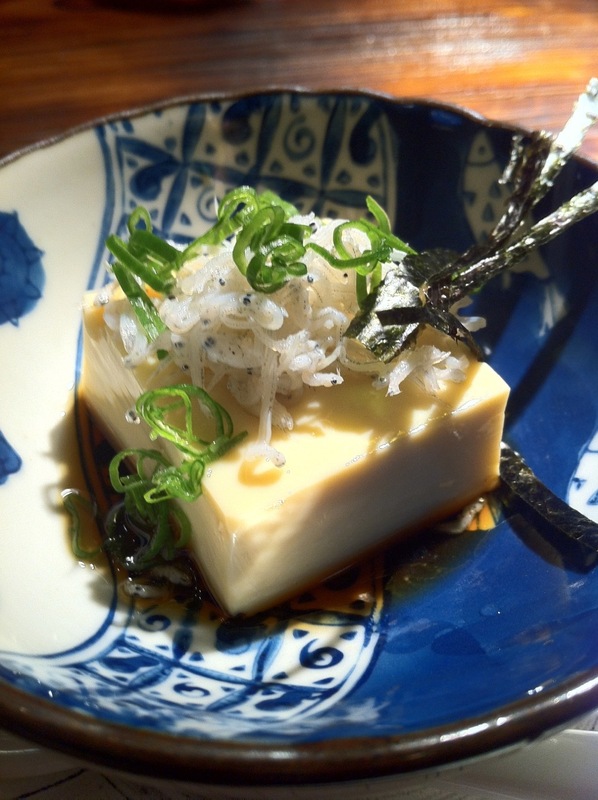 Just the glutton in me wanted to try this new dish from Watanabe-san. 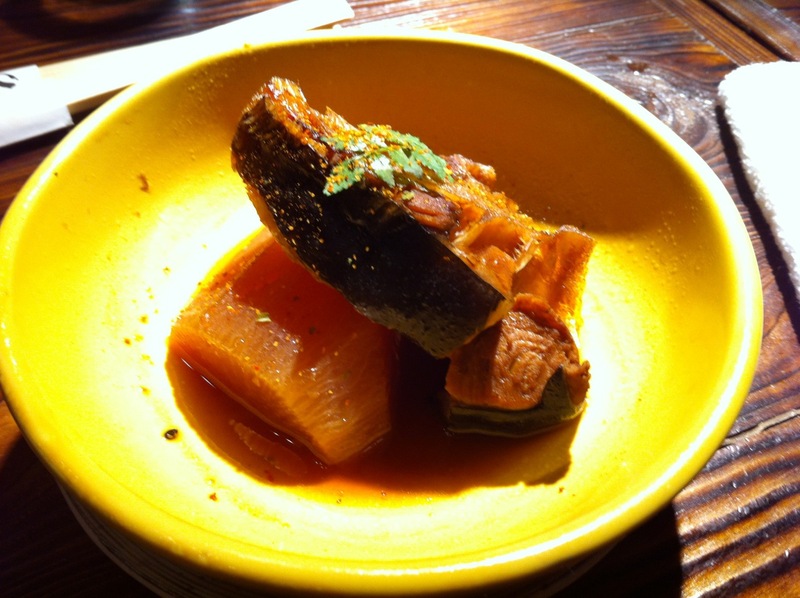 The daikon as been braised just right with infused flavour of the fish and soy sauce. The fish is tender and flavourful. A nice end to a satisfying dinner.